American author Lauren Weisberger has been awarded a Gold Bestseller Award, having sold over​ 750,000​ copies of The Devil Wears Prada in the UK. In 2006, Weisberger’s novel was made into a major motion picture by Fox 2000 starring Meryl Stree​p, Anne Hathaway, and Emily Blunt. Last year, it was announced that Elton John and Paul Rudnick will be writing the Broadway-bound musical adaptation of The Devil Wears Prada. The success and popularity of Weisberger’s book continues, well over a decade ​after ​its initial publication. 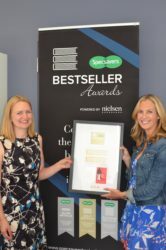 Lauren Weisberger was presented her Gold Specsavers Bestseller Award, powered by Nielsen, at HarperCollins ​London Bridge office on the 9th July 2018. Weisberger is in the UK to launch her latest book, The Wives, which will be released on the 12th July (When Life Gives you Lululemons in the US). ​The award was presented by Specsavers, Harper Collins Fiction Publishing Director Lynne Drew and Nielsen representative Annie Woodfield. The Specsavers Bestseller Awards, powered by Nielsen Book, celebrates the UK’s bestselling books each year. 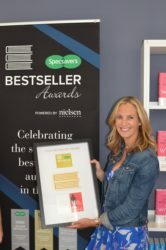 Since launching in 2001, the Specsavers Bestseller Awards have recognised some of the UK’s most prolific writers including Tom Kerridge, Paula Hawkins, Philip Pullman and Cecilia Ahearn.